With NASSAU’s 9000 Energy doors, it is possible to give your employees a working environment filled with natural light without compromising your heat consumption. The specially constructed 3-layered window-sections give a unique insulation value for a window door and it is therefore possible to create a bright and productive indoor-climate, and at the same time lower the energy consumption drastically. NASSAU 9000 Energy is the environmentally friendly alternative to the traditional sectional window-door. At the same time, it is a good investment. In Odense Harbor’s new administrative building on the harbor of Odense in Denmark service and operation of the entire harbor has been gathered in one building. 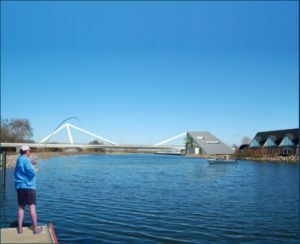 The building, which was designed by Bystrup Architects, will furthermore control Odin’s Bridge which will be Northern Europe’s largest turning-bridge. If you compare a NASSAU 9000 Energy door with a typical aluminum door with the same measurements and number of window-sections, considerable energy savings are obtainable. With a 9000 Energy door measuring 4×4 meters and 4 window-sections, a u-value of 1,62 W/m2K is possible. A typical aluminum door with the same number of window-sections will typically have a u-value in the around 3,0 W/m2K. With an energy-price of € 0,20 a yearly cost-saving around € 600 is obtained. 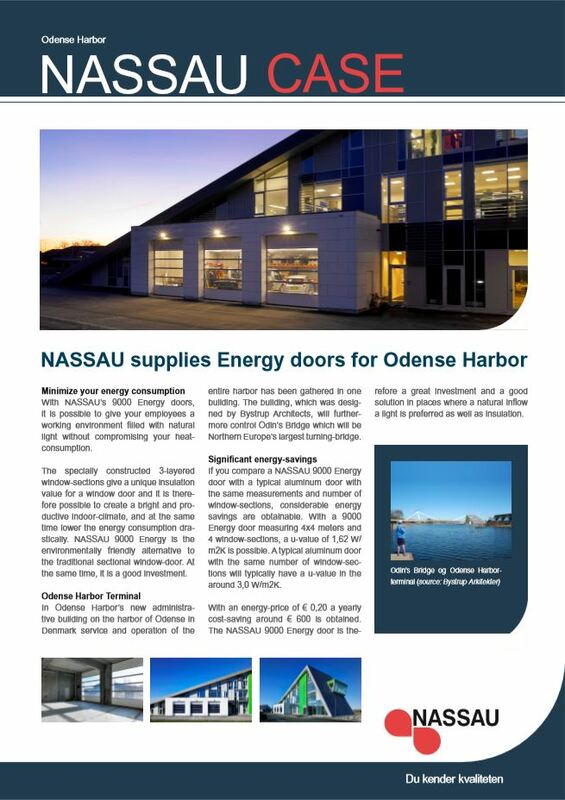 The NASSAU 9000 Energy door is therefore a great investment and a good solution in places where a natural inflow a light is preferred as well as insulation.